Our Bristol wedding bands play joyous, upbeat songs from across the decades to get your guests up on their feet and dancing. Vibrant 4-piece band lead by fantastic female vocalist, playing all the hottest new hits! DJ service, acoustic sets and additional musicians also available. Authentic jazz and swing band playing Gatsby, soul and jive with a variety of line-up options and additional musicians available. Tying the knot in Bristol? Congratulations – Bristol is a cosmopolitan city with a thriving music scene and a plethora of trendy cafes and bars where your guests can sit and nurse their hangovers the morning after! Our bands have played in all areas of the city – including Clifton, Totterdown, Temple Meads, Redcliffe, Montpellier and Stoke Bishop – and also travel far beyond. 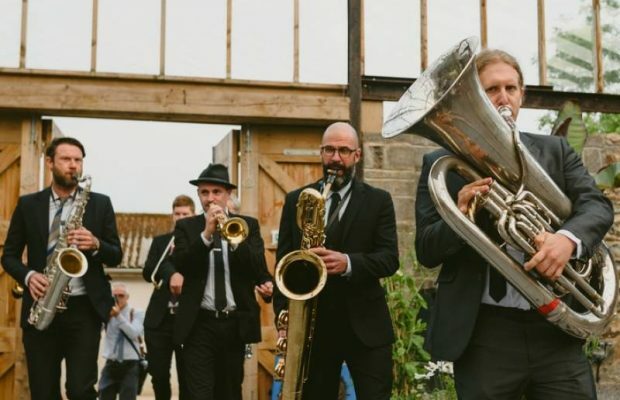 Our Bristol bands for hire are handpicked, so that you can be sure you’ll get fantastic wedding entertainment that your guests will remember long after the party has finished. We also offer the best value: if another agency offers you one of our bands at a lower price, we’ll match their offer. What style of music do our Bristol wedding bands play? Our Bristol wedding bands tend to specialise in the biggest anthems of the last sixty years. 3-piece and 4-piece line-ups tend to focus on rock and pop music from Beatles and Buddy Holly to Coldplay, The Killers and Mumford and Sons, whilst line-ups include keyboards and brass sections, allowing them to perform soul and soul-infused pop music from Chaka Khan to Bruno Mars. If your tastes aren’t super modern, fear not! How about hiring a wedding ceilidh band or a wedding jazz band? For more offbeat ideas, check out our alternative wedding bands. We can provide Bristol wedding music for every part of your special day, not just the evening wedding reception. Classical wedding musicians can make for a magical accompaniment during ceremonies, so why not hire a string quartet to accompany you whilst you walk down the aisle? For a more upbeat ambience at your drinks reception or wedding banquet, book a wedding singer.